Nearly 16,000 elementary students at 87 Northwestern Ontario schools expected to take part in the program, which provide two free weekly servings of fruit and vegetables. 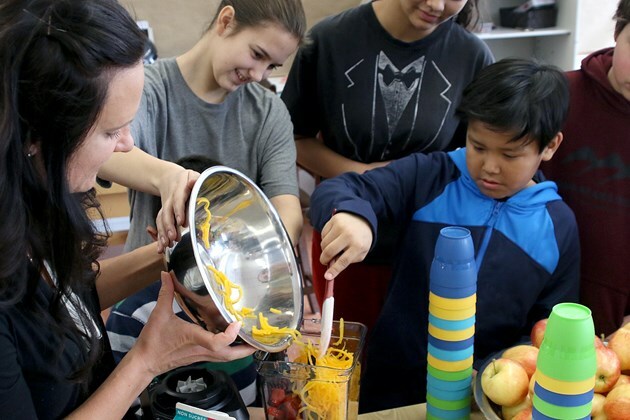 THUNDER BAY – Students at schools across Ontario’s northwest will now have access to even more healthy food options in the classroom. The Thunder Bay District Health Unit on Thursday introduced the launch of the Northern Fruit and Vegetable Program into 87 elementary schools in the region, including schools on remote First Nations where access to fresh produce can be scarce during the winter months. Athena Willoughby, a Grade 8 student at Alqonquin Avenue Public School, said the twice-a-week program will have a huge impact on children across the north. “I like that it helps a lot of children who can’t bring healthy snacks to school and really can’t eat it. It helps a lot with high nutrition and proteins,” the 13-year-old said.